Handmade Adjustable Cotton Batik and Suede Y Necklace, "Surabhi Trail"
From the Pertiwi Collection comes this exotic Y-necklace. The adjustable cord is made from 100% cotton and stamped with batik patterns in deep rose, yellow, and blue. 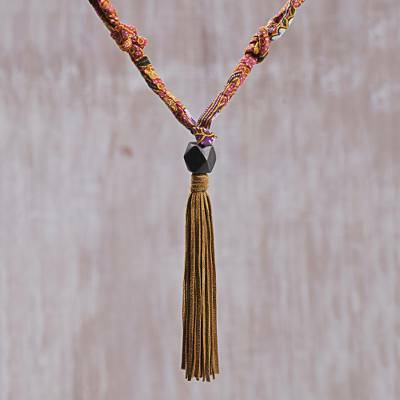 A suede tassel and sono wood bead complete the design. The necklace is named after the Hindu goddess Surabhi, or Kamadhenu, who is known as the mother of all cows. "Ibu Pertiwi is the Mother Nature of Indonesia… This unique collection of jewelry is inspired by travel, long lost cultures, and the desire to preserve Mother Nature's gifts." "Contemporary style meets primitive design in this environmentally conscious collection of statement jewelry. Natural materials are found on land or washed up from the sea — bamboo, sea glass, coconut shell, bone and horn. Combined sparingly with sterling silver, bamboo becomes a one-of-a-kind ring, tumbled sea glass becomes a simple and elegant pendant, shells become stamps that create patterns in clay. "Ibu Pertiwi is the Mother Nature of Indonesia, personifying land and sea, who kindly supplies our materials and inspiration. "This unique collection of jewelry is inspired by travel, long lost cultures, and the desire to preserve Mother Nature's gifts. "When you wear our jewelry, you are proclaiming an awareness of the planet's diversity and beauty," the artisans say. "We probably hold the record for low environmental impact jewelry. Our jewelry designs are dictated by the natural shapes of the organic materials we use. Each piece comes to life as the materials are worked, shaped and polished by local craftspeople. "For shoppers who wear our jewelry, you can be sure you have supported many families in a responsible, low impact way. Also, you are proclaiming your awareness of the many important cultures of our world."